SUMMARY: And their doom comes swiftly. Thrilling, engaging and brilliantly woven together, Ten is a murder mystery at its best with humor and romance seamlessly blended in. Smoothly written with great descriptions, and a very steady pacing that kept the development coming but the action moving, McNeil’s talent continues to shine. 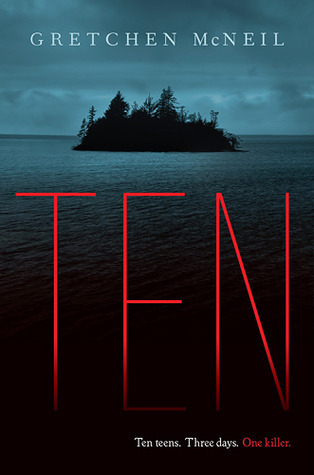 With plenty of shocking twists and a mindblowing climax, Ten is definitely a must read for everyone. I loved Meg’s character, from the way she saw things maybe a little differently to her fierce protectiveness of her best friend and even those she’s just now meeting on the island. She is awkward at all the right times, yet has a boldness to her that is admirable and says much about her character. Even as the tension starts to rise, and it becomes clear that the deaths are not so random, Meg finds a way to, ultimately, keep her cool and try to figure things out. With a well done romance budding between herself and T.J., a guy she’s crushed on for so long that goes to her school, but selfless to a fault when it comes to her best friend who, in many ways, treats her sort of crappy, Meg is very easily relatable and understandable, and a character that I became fully vested in and rooted for nonstop. The rest of the characters are all well done, with some having more scenes and development than others depending on how well Meg knows or gets to know them. The murder aspect of this book is so perfectly well done, with seemingly innocent things later becoming something big, and even things that the reader’s are supposed to know are nefarious while anyone in that situation would normally think nothing of it. McNeil times her killings beautifully, building in the shock factor of the deaths and screwing with both the characters and reader’s heads. Building to a stunning and shocking climax, and ending things perfectly for the book, Ten has just the right amount of predictable things mixed into an overall unpredictable who-done-it. Even when readers start to maybe figure things out, McNeil holds enough cards close in that there is still plenty of surprises and hard impact to come. The writing is fantastic, with plenty of great one-liners and descriptions. Building in intensity right alongside the growing tension in the house, readers will feel like they are right there in the midst of the chaos. Weaving in emotions on top of that, with an awkward but sweet romance, McNeil has hit it out of the park with this one. Though possibly holding elements similar to already done books, McNeil has built this one to hold those lasting aspects while still twisting it to something very much her own. I'm excited for this book, but really nervous for it as well. I'm a massive Agatha Christie fan and to see her books redone is.. I dunno. I can already tell that because of the romance, this book will have the play ending of Ten Little Indians and not the book ending. I'm glad to hear you really liked this book. I'm hearing mixed reviews for it.